So yesterday I did the vampire Carmilla’s bloody nightgown, and then I got to thinking how unfair it was that she got all the attention and long-suffering Laura got none. As a matter of fact, I can’t even remember Laura’s name without referring to Wikipedia or my previous entry. Face it, you really have to pile on the lace to make mild victims as interesting as seductive vampire women in bloody nightgowns. And so pile I did, and here is a dress from 1870 that Laura might have worn. To be honest, even though as near as I can tell 1870 is an accurate enough date for the book’s setting, I thought long and hard about going back a few years for inspiration. After all, Laura and her father lived in a castle in Germany in the middle of nowhere and who knows how well Laura kept up with English fashion in between vampire ravishings. But then I thought, she was still a growing girl and if her dresses were two or three years old, maybe she’d have outgrown them and wouldn’t be wearing anything that old? Maybe since her father is sort of vaguely rich, she orders a lot of new dresses? Maybe she spends a lot of time remaking her dresses referring to whatever fashion news she can get, because life in an isolated castle is so boring? 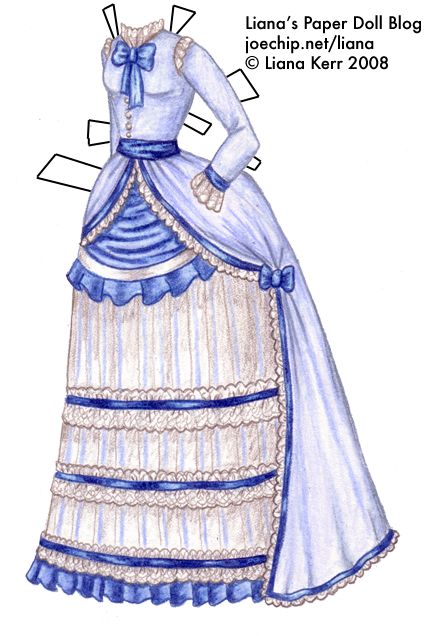 So I over-thought this until I got fed up and tried to make an 1870s style day dress anyways, like I had initially planned. Since it’s not a copy of any one dress, it’s probably not historically accurate (I definitely have my misgivings about the way the overskirt turned out) but oh well, it was sure fun to draw. Gorgeous gown! I have longed to see a late Victorian style dress on your blog! What´s about some Regency dresses from Persuasion, also?